This comprehensive guide takes state deaf-blind projects systematically through a data-based decision-making process to analyze current early identification efforts and determine specific strategies to improve efforts at local and state levels. Use of the guide is the first step of an overall early identification and referral improvement process. Select your state to download your Self-Assessment Guide. The guide will download in a PDF format automatically. Start with the numbers! 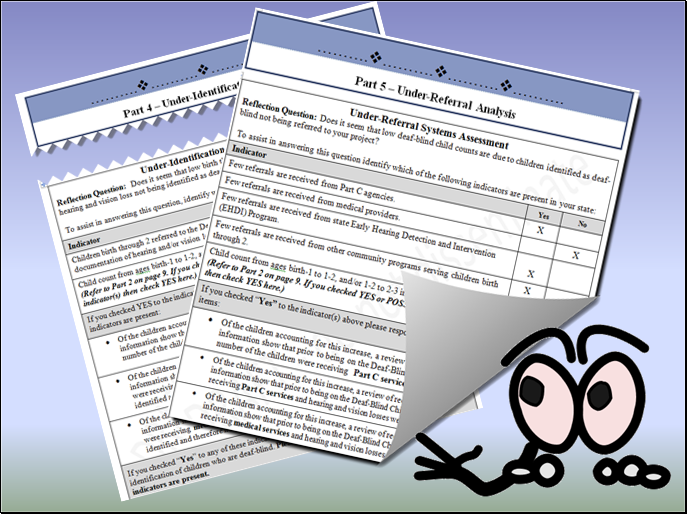 Once a state is chosen and you have clicked DOWNLOAD a fillable PDF will be downloaded. It can then be completed on the computer or in a printed format. State data tables are pre-populated. 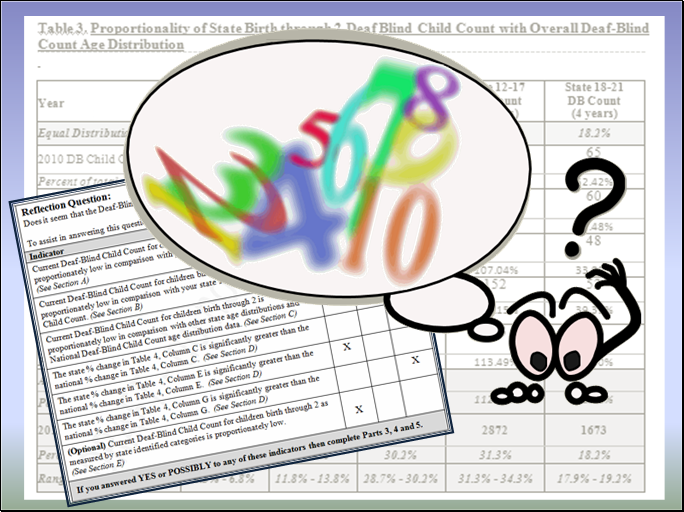 This information is then used to systemically analyze Deaf-Blind Child Count data and current early identification and referral efforts. A section is then provided to reflect on whether underlying issue(s) exist related to under-identification, under-referral or both. 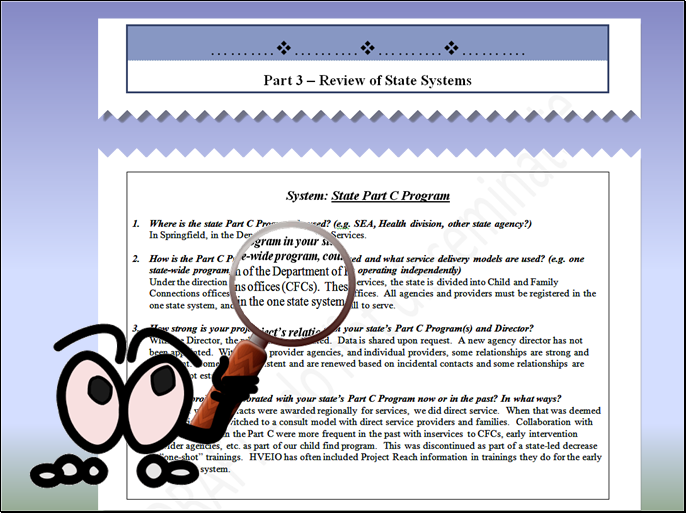 Next, users are guided through a process of assessing the “state of the state.” This is a place to pull together information related to the level of, or potential for, collaboration across various systems: Part C, Medical Community, EHDI (Early Hearing Detection and Intervention) programs and other Community Programs serving infants and toddlers. The next step is to carefully scrutinize the current situation in relation to both under-identification and under-referral and identify the state system(s) and issue(s) where the greatest indicators of need for change exist. Following these steps, the user is guided through a decision making matrix, based on the feasibility and likelihood of impact. This will help determine where to target efforts. In the final step an action plan will be developed using a planning guide aligned with evidence-based early identification and referral practices. Implementation of the action plan with technical assistance, as needed, from NCDB is a part of this final step. Schedule Adequate Time. Set aside enough time to complete the guide. Pilot states indicated spending more time than anticipated gathering information and going through the various sections of the guide. Also, avoid very busy times of the year. Divide up Assignments. If you have multiple staff, assign different staff responsibility for different sections of the guide based on experience and knowledge. Then meet as a group, review what has been done and put it all together. Make use of your Advisory Panel. The guide covers a number of state systems and groups. Involving these key stakeholder groups in completing the guide can be very beneficial. Consider devoting part of a project Advisory Panel meeting to gathering needed information. Focus on Feasibility, Not Just Need. Once you have identified areas of need, complete Section 3 of the Decision Making Matrix carefully. By considering the feasibility and potential for making positive inroads with the various systems you can focus your energies in areas where you have the likelihood for the "biggest bang for your buck". Attend to Evidence Based Practices. 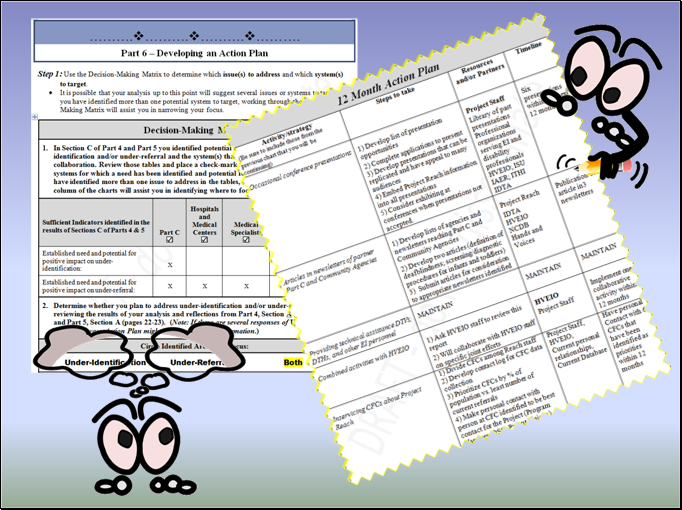 When you develop your Action Plan make sure you are incorporating evidence based practices into your activities and the design of any materials. Spend Time in the Toolbox. Explore the resources in the toolbox. The toolbox is a rich source of materials for use in integrating evidence-based practices into your Action Plan.